This educational video series from Dr. Robert LaPrade of The Steadman Clinic teaches non-orthopedic physicians, medical students and patients about the anatomy of the knee and the visual indicators of common knee injuries through magnetic resonance imaging. “It is important for us as physicians to read MRI scans and then use the information from them to best treat the patient," said Dr. LaPrade. Sports medicine knee specialist Robert LaPrade, MD, PhD has published a new video series to educate non-orthopedic physicians, medical students and patients on How to Read an MRI of the Knee. When an injury is present, clinicians use magnetic resonance imaging (MRI) to help diagnose ligament injuries, meniscal tears, cartilage problems, stress fractures and bone bruises. In this video series, Dr. LaPrade looks at individual MRIs of the knee to address anatomic structures and visual indicators of common knee injuries for professionals and patients to gain a better understanding of film reviews. A MRI can be viewed from three different perspectives: coronal (front to back), sagittal (side to side) and axial (top to bottom). Each view highlights certain aspects of an injury. As imaging moves deeper into the knee, structures become more defined, which helps clinicians get a better understanding of the injury pathology. It is important to utilize all three perspectives to ensure an accurate diagnosis. Knowledge of the anatomy of the knee is key to a successful interpretation of a MRI. In the series “How to Read an MRI of the Knee”, Dr. LaPrade looks at the anatomy of a normal knee and identifies the healthy ligament structures that help stabilize the knee; the anterior cruciate ligament (ACL), posterior cruciate ligament (PCL), medial collateral ligament (MCL) and lateral (fibular) collateral ligament (LCL). He then highlights the medial and lateral menisci along with the posterolateral corner (PLC) of the knee, patellar tendon and quadriceps tendon. Once the healthy anatomical structures are established Dr. LaPrade demonstrates how to read a MRI of the knee for ACL, PCL, MCL and PLC injuries, meniscal root tears, medial meniscus tears and osteochondritis dissecans lesions. In each case, he thoroughly examines all three MRI views to identify if there is bone bruising or an additional injury present. “It is important for us as physicians to read MRI scans and then use the information from them to best treat the patient. Simply reading an MRI report is not good enough. Hopefully this teaching series will provide some assistance in helping others to both understand how to interpret some of the basic structures in the knee and also to understand what an injury looks like on an MRI scan,” said sports medicine knee specialist Dr. LaPrade. 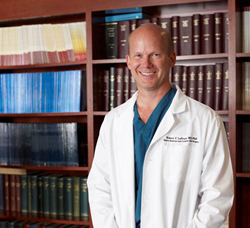 About Robert LaPrade, MD, PhD. Robert LaPrade, MD, PhD. is a sports medicine knee specialist at The Steadman Clinic in Vail, Colorado. As the Chief Medical Officer at the Steadman Philippon Research Institute, Dr. LaPrade remains on the cutting-edge of orthopaedic care through his dedication to sports medicine research. Today, many of the current anatomic-based knee reconstructions used by surgeons around the world were designed and validated based upon Dr. LaPrade’s research.